Shortly after news of the CHP was leaked, Councilwoman Diller was forced to call an emergency public hearing. At least one is required by County law for any major plan. In July 2015, hundreds of area residents came out to Holy Family Church and were shocked and dismayed to find out that the CHP was already well advanced and would be difficult to stop. Had she, along with our two State Legislators brought this to the public two years earlier, it could have been an entirely different outcome. A way could have been found to provide the Felician Sisters with their 60 units of affordable housing, which the STOP Campaign supported, while preserving the bulk as a regional park. The Nuns at that time had even favored such an outcome over the development. Immediately after this first and only hearing, "Save Ogletown Pond" (SOP) grew exponentially, with the immediate goal of steering any development away from the "Ogletown Pond" critical habitat area. The developers did comply and adjusted their plan to the west and closer to Breezewood. But the larger goal did not stop there; it was soon obvious that everyone wanted the entire parcel for dedicated open space, wetland protection, wildlife buffer, and ultimately, a regional park. The Ogletown-S. Newark area is devoid of such a facility, that could be walkable, jogable, or bikeable from their homes. 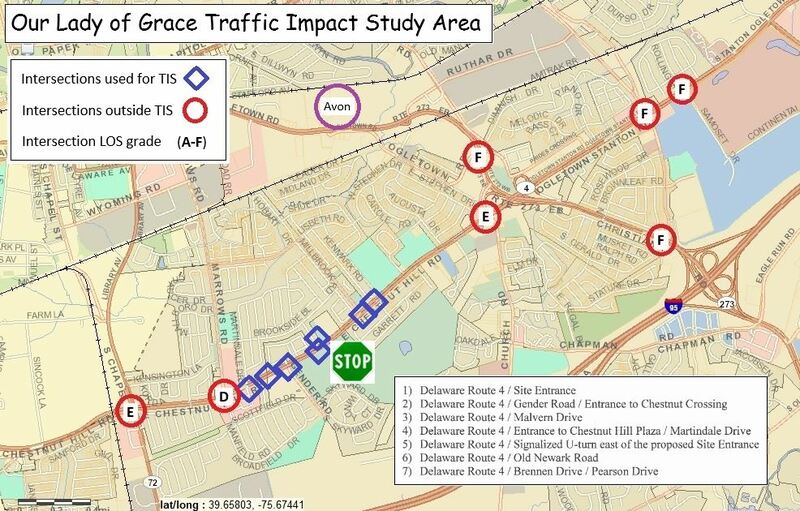 Those closest -- Glasgow and Pike Creek -- are a 20+ minute drive for most, which contradicts Gov Minner's "Livable Delaware" and DNREC's "Trails and Pathways" initiatives (among others). 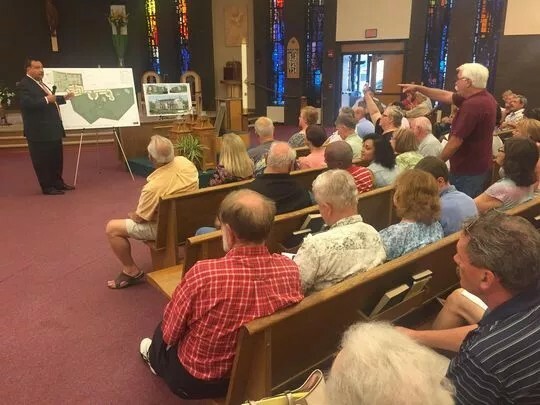 The Orphanage Property represented the last potential green space that can be designated, and in the process, it would prevent some of the horrific damage being done to Delaware's bio-diversity and wildlife habitat according to a recent report authored by Senator Stephanie Hansen. That chance is now gone due to political apathy and indifference, and a shunning of "We The People". In the time that ensued, the announcement came through that the Sisters sold the OP to Robert Sipple, a major land developer. With Ryan Homes, he is currently heading up the controversial LaGrange development along Rt.40 in Glasgow, where they are fighting to develop a "permanently" protected historical area (more on that in future posts). Advocates re-organized and thought it best to contact Mr Sipple directly, and ask for a meeting to find if there was a price that he and his people would accept in a buyout proposal. A non-STOP advocate (who chose not to be identified) made contact with Mr Sipple through Joseph Setting of Setting Properties. Mr Setting is the developer that was cited by the Wilmington News Journal as the developer of the OP just shortly after the CHP was leaked and then announced in 2015. He continues in two LLCs that are associated with the development of the OP, which runs contradictory to his claim of being disassociated. The meeting took place around lunch, with Senator Townsend in attendance. Apparently, Rep Osienski was unable to attend for medical purposes. 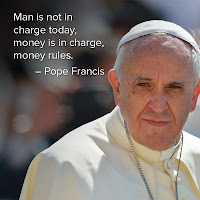 Or so he says. There was no agenda, but Mr Sipple quoted a figure of $7.14M that he thought would be an acceptable buyout cost, but that he would need to meet with his partners to discuss. Little is known about the meeting beyond that, but Senator Townsend insisted that his repeated calls and emails to Mr Sipple since then had gone unanswered. It is his opinion that Mr Sipple's lack of confidence in NCC is what has him now moving forward with the CHP as opposed to any thoughts of selling. Complete silence from all parties would follow, with the exception of one instant message from Exec Meyer on the evening of Jan 17 putting his $3+M offer in writing. His language suggested he was naive about the current situation, and questioned if the Bond Bill funding had come through on the State side. Nothing he said indicated he had spoken with Senator Townsend or Rep Osienski. He further suggested that it was their failure to progress that held things up. Meanwhile, Townsend replied "I have seen email communications from Meyer that are not at all a rosy picture of support for [STOP]. Meyer (of course) says he supports [the buyout], but then goes on to say how the County can't afford to participate." Councilwoman Lisa Diller declared herself detached and unwilling to champion the cause, insisting all along that the land was not for sale. Executive Meyer was not a sincere proponent of STOP either, and kept finding reasons not to commit. Was it because he accepted maximum campaign contributions from numerous developers in Delaware? 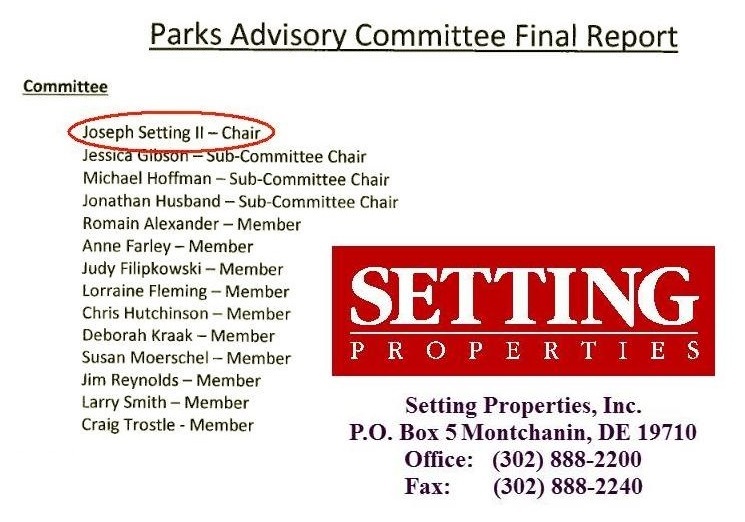 He also appointed Joseph Setting, a campaign donor and developer of the OP (according to the Wilmington News Journal), to serve as Chair of his Parks Transition Team. Mr Setting's role was a direct conflict of interest, giving him significant influence and input over where NCC parkland was prioritized. He remains vested in the property today via two LLCs.